Last night I went to dinner at The Breslin where I consumed an entire pig. Admittedly I had a little help -- from fifteen other people. They served up the whole pig, potatoes roasted in pig fat, beautiful baby carrots, broccoli rabe, and one of the most delicious Caesar salads I've ever had. Then they brought out a bowl full of brains, snout, cheek, and tongue. It was a great dining experience. You would think after all that that I would have had enough pork but that was not the case. I wanted to share some of this porkiness with Jen. I had some leftover pork from the dinner so I made her a pulled pork quesadilla for lunch but I thought it would be a good idea to make a pork-centered meal for Jen so that she could enjoy some of what she missed last night. Jen has been eating a tremendous amount of watermelon lately, approximately one every two days. The babies have been giving her a lot of acid reflux and the watermelon has been helping a lot. Since we had so much lying around I decided to turn some of it into a acid reflux-friendly salad. I added some arugula, red leaf lettuce, red onion, feta cheese, whole basil leaf, rice wine vinegar, olive oil, salt, and pepper and tossed it all together. 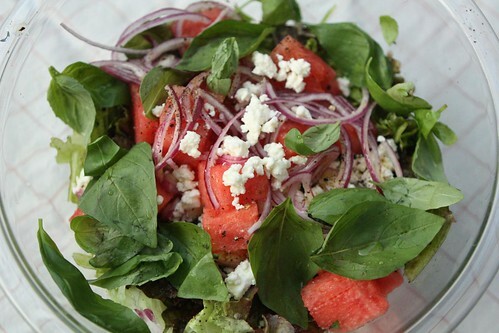 This was pretty tasty though I'm pretty sure every other ingredient in this salad probably negates the magical properties of the watermelon. 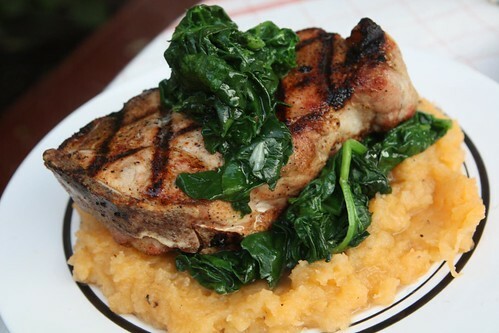 For the main course I grilled up some pork chops and served them along with some mashed rutabaga and spinach sauteed with garlic and olive oil. The rutabaga wasn't exactly seasonal but it was quite tasty. It was a beautiful night, after a rainy day, and we ate outside. I think this is the first time I've ever eaten mashed rutabaga outside. It's a bit strange eating a food most commonly associated with Thanksgiving in the open air. This must be what it's like if you celebrate Christmas in Los Angeles. It's always depressed me to see images of people having Christmas in a hot climate. There are no palm trees at the North Pole! 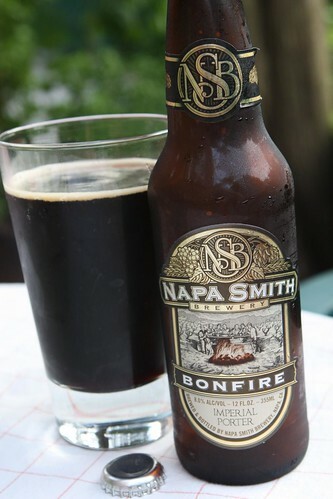 To go along with the grilled pork I cracked open this Bonfire Imperial Porter from Napa Smith Brewery, the second beer I've had from this new brewery. Well, new to the Northeast. It was a really nice porter but not something I'd normally select for an out door barbecue. However, since we've been lucky enough to have several outdoor barbecues a week lately I don't feel the need to select only thematically appropriate beers for our outdoor cooking escapades. After dinner we enjoyed a little more bootleg hockey which is nice because instead of commercials they show you some strange documentary where Marián Gáborík buys a Christmas tree. So much better than a Ford commercial. Especially since I spent two hours this morning a a Ford dealership test driving new cars that will fit baby seats, the extra kick in the pants being delivered with the realization that our current car doesn't actually fit our car seats at all meaning that we may need to buy 100% more new car than we'd previously planned on. In a Golden Girls-style solution to our problems we went to Longford's where we waded through ten-year-olds so that we could experience what Jen's father has declared to be the worst ice cream on planet Earth. Indeed it is true that communists with diseased taste buds are not fond of this ice cream at all. All others agree that it is quite delicious. And it goes perfectly with playoff hockey.